Charles Edward Spendlow was born 22th Aug 1895 in Bracebridge Heath (near Lincoln) where he lived at Stevenson Cottages with his parents, 3 brothers and 3 sisters. A few years earlier his family had moved to Bracebridge from Grainthorpe, near Louth. By the time he was 15 the family had moved to Normanton on Cliffe, but Charlie was working as a cow-boy on a farm in Tuxford, where his elder brother Jack was a waggoner. 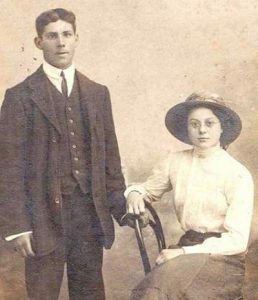 Their parents (John) William (a farm labourer) and (Eliza) Jane were living next to the post office in Main Street, Normanton. William’s brother Isaac had also moved with his family from Bracebridge Heath to Normanton. 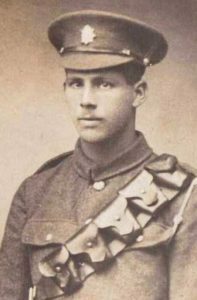 After basic training he was sent (26 Jun 1915) to 70th Field Ambulance at Borden, Hampshire, but thereafter served with 69th Field Ambulance, part of the newly formed 23rd Division, one of the first of Kitcheners’ New Army units. On 25th Aug he sailed from Southampton to Le Havre on the requisitioned troop/horse ship Bellerophon. After only a few days of trench familarisation the division was moved to the front line and stayed on the French/Belgian border, taking part in the Somme Battles in 1916. In June 1917 69th Field Ambulance were with the division in Belgium, preparing for the Battle of Messines and Driver Spendlow was acting as groom for the transport officer. On 3rd June Charlie was hit whilst taking a pack mule with rations to the front under heavy fire. It’s not clear if he was killed outright (as the captain claimed in a letter to his parents) or whether he died soon afterwards. He was buried on 5th June at Hop Store Cemetery, Vlamertinge (2 miles west of Ypres). The Hop Store (which is still there) had been used by Field Ambulance units as a field dressing station, so he would have been very familiar with it. The small cemetery (just out of range of the German artillery) had recently been drained by the Royal Engineers.